My name is Maggie and I am a chocoholic who is bound to bring you a new chocolate cookie recipe at least once a quarter. This is not a joke. I seriously don’t think I can stop at this point. I don’t think I have to though as long as I have recipes like this (and my everyday chocolate smoothie with spinach and flax-seed.) 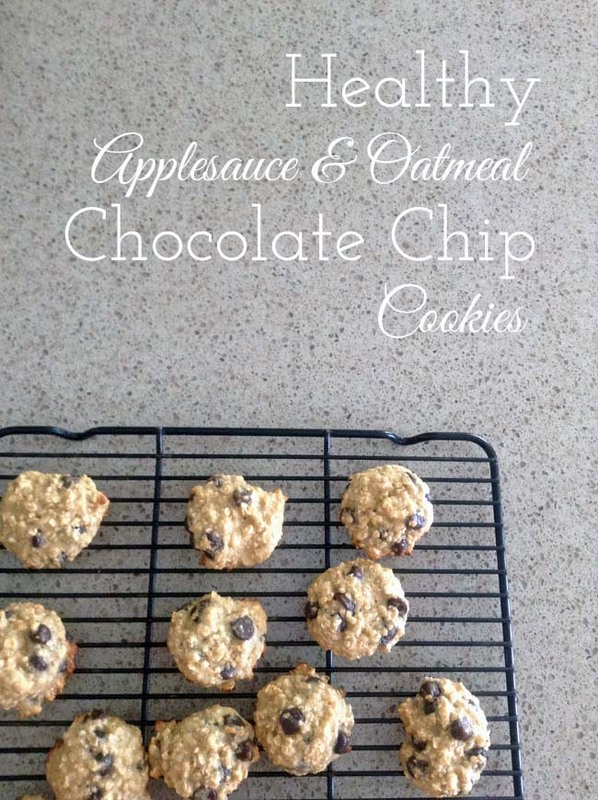 Sure there is sugar in this skinny chocolate chip cookie, but with applesauce and dark chocolate it’s not as bad as it could be. And at this point, that might be as good as it gets for me. I found this recipe from MuddyBoots that served as a great base. I only changed up the chocolate chips to 2 cups of dark chocolate chips and all-purpose flour to whole wheat. Between that and the oatmeal (yah! good for breastfeeding! ), the cookies are rich and thick enough that one or two is plenty. These cookies are soft and great with milk. The whole wheat flour takes away a little of the “fluff”, but with the oatmeal, you don’t miss it. Preheat oven to 350 degrees. Grease cookie sheets or lay down silpats. In a large bowl, mix together the applesauce and sugars until well blended. Beat in the eggs and vanilla. Gradually stir in the flour and oats, then fold in the chocolate chips. Drop by heaping spoonfuls onto the prepared baking sheets. Bake for 13 to 16 minutes in the preheated oven, until the bottoms are golden. Cool on wire racks. What is your favorite way to sneak in healthy ingredients in not-so-healthy treats?